Summer vibes: being in the moment of summer. This brings us happiness and can give a boost of energy. Lets take a look on how you can bring this feeling in your home. First we should make the difference between decorating a summer house and decorating a house with a summer feeling all year round. Where better than Florida to get our inspiration? It is easy to decorate your summer house in a nautical style: use blue tones combined with white, and add some sparkle with some yellow and red touches. Rustic wood, shells, nautical items and soon you will feel as being at the beach. Decorating your home, inspired by, to have the summer feeling all year round is a different approach. So lets take a look at the secret of bringing the relaxed feeling evoked by holiday and seaside right in the heart of your home. We want to create a timeless elegance by using some nautical element but rather in a refined execution than with a rustically finish. They can add a touch of style in our contemporary home. Fluid lines and fluid spaces to create a natural flow, all this to enhance a relaxed feeling. As being in the same rhythm with the nature around. A sofa in a dark blue cotton velvet in front of a wallpaper with a banana leave print will add a sparkling touch. Bringing nature inside by using some tropical elements such as a colourful printed mural with exotic birds, or just by having some big plants in the room. Green is a colour promoting physical and emotional well-being. Blue will purify our thinking and bring tranquility. Neutral colours will pair with almost every colour and will give us a feeling of security, being grounded. One or two nautical element should be there. It can be anything related to sailing and the seaside. 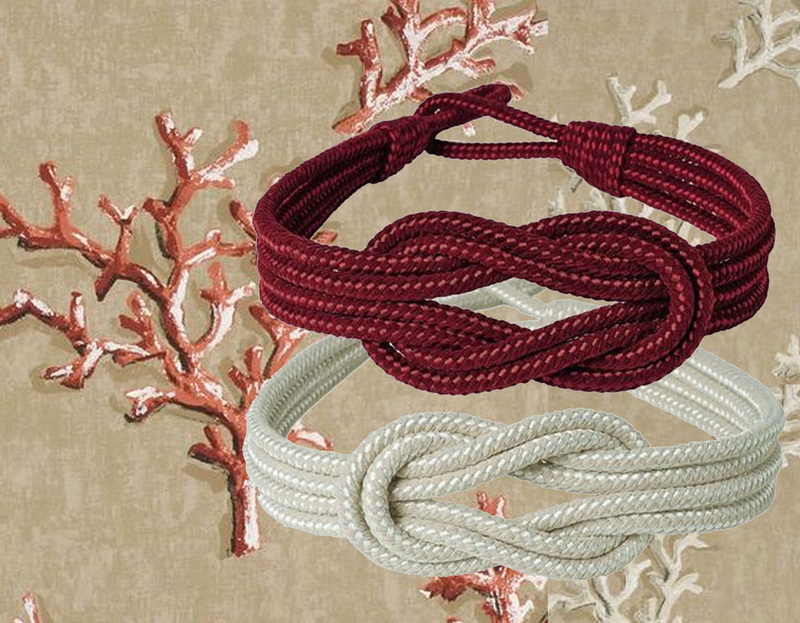 Knowing how to make a knot can be vital living at the seaside, ropes and knots are also inspiring designers. They will think out of the box to create a more interesting nautical look. A nautical wallpaper with a big print of ropes and knots can make a cool statement in an entrance or give more character the a junior room. By the way, nautical is a perfect theme for a kids' room as it can go from toddler till junior, depending on the colour accents or by changing some of the decoration. Adding a huge knot as pillow or stool can bring a playful touch in a modern apartment. 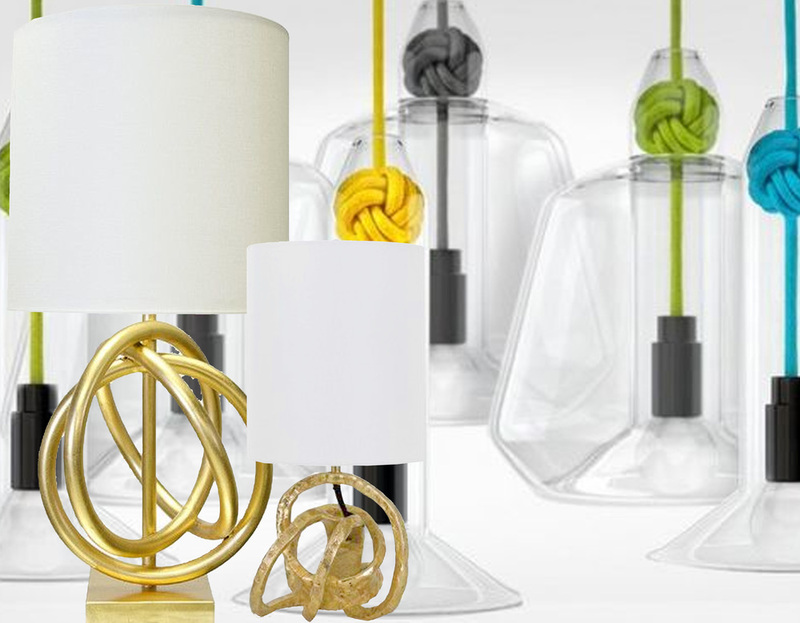 No need to decorate the whole room with nautical elements, just a knot can be a playful hint: a colourful accent for a transparent pending lamp or a stylish lamp with the hint of a knot as it would be hand-drawn. Coral is another stylish, and elegant evergreen in interior as well as in fashion. It might be used as the colour coral, the shape of it or the real coral, it will always be a sign for sophistication as we know it as a luxury material. Natural linen curtains with a coral print and gathered in a natural way by a nautical inspired tiebacks, will give character to the most simple room. Sailing: action, wind, the beach, boats. There is more when we think of the seaside: sand, stones, shells, waves, water.... Natural tones, soft beige tones, and neutrals. But Florida can be more: think of Miami with the pastel coloured Art Deco houses. Modern art scene, Art Basel. So let us add some colour, modern art can bring a vibrant touch to a room in a natural colour scheme. A modern interior can give a cold feeling, so live artfully. When we think of the beach, the shore line, the waves, stones we see all smooth lines. The rocks are shaped by the wind and the water into rounded shapes. Our seating area could be inspired by the rocks and the stones, and embrace those round shapes. They are inviting, comforting. A serene yet sparkling decor, the interior has grown, in an organically way. And the stones can give inspiration for a floor which looks like a piece of art. Terrazzo, creating the floor by using different types and sizes of marble as a sustainable decoration option, a great way to have a floor which gives a nice cool feeling. A natural material with an artisanal touch. 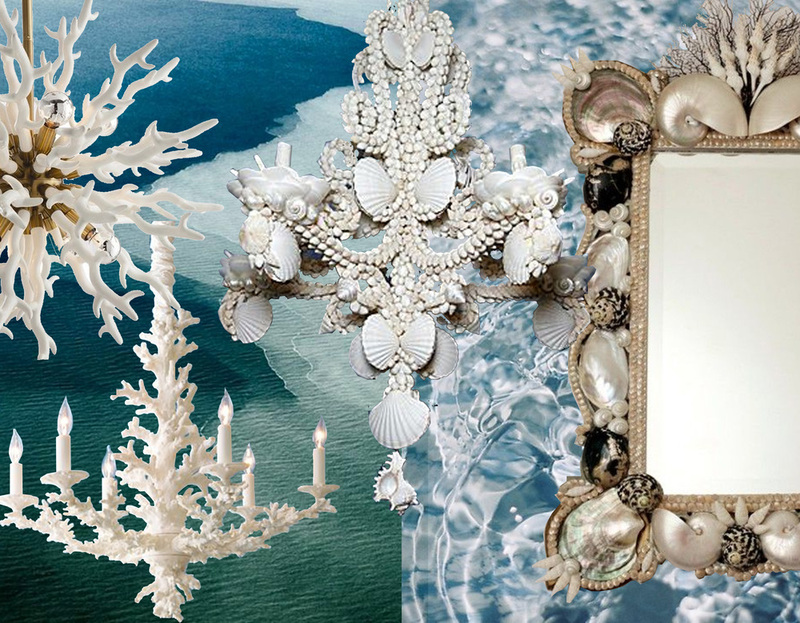 Shells keep inspiring: from a basic collection of shells put in a glass vase, which you will find in every summer house with a coastal touch, to exquisite mother of pearl wallpaper. The chandeliers of Panton with seashell disks got a design classic which will fit any bohemian interior. 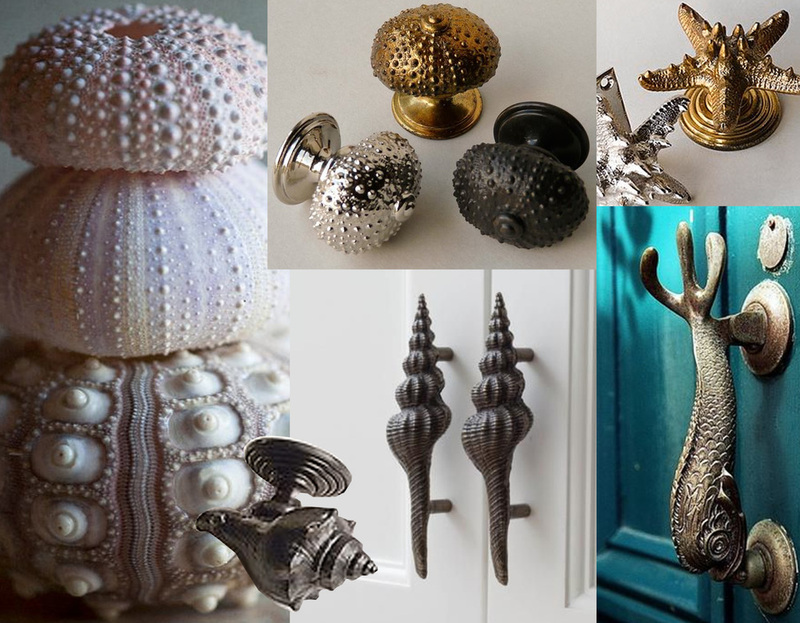 Or you can simply have shells as decorative door knob on a piece of furniture. Nature provides all to create a calm environment with a relaxed feeling. So we have seen that nature can inspire us for a relaxing interior: neutral colour, blue tones, round shapes. But what about adding a wow factor to your interior? 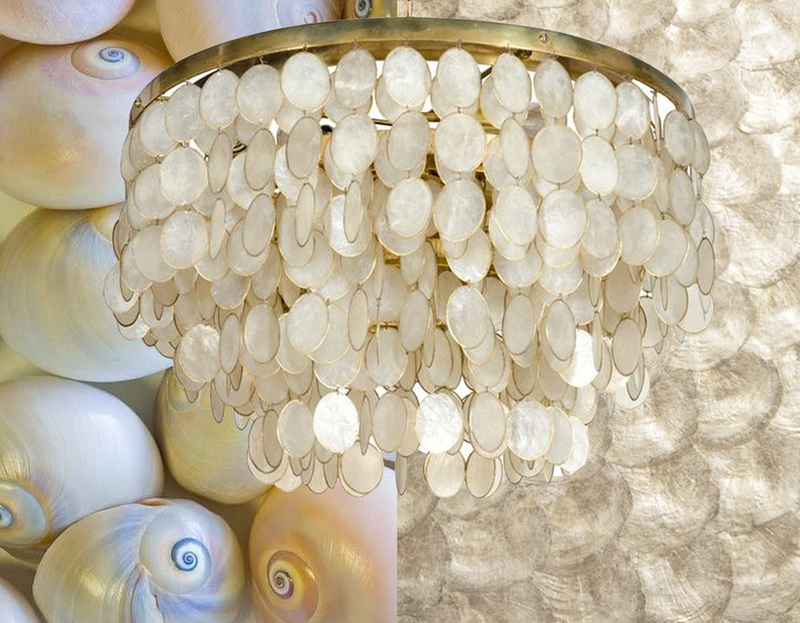 A baroque chandelier with shells as an extravagant touch in a modern home. Lamps with shells can add a sculptural presence in the room, coral inspired lamps can bring elegance. Think out of the ordinary, add drama, dare to decorate. So mirror, mirror on the wall, who is the most beautiful in our home? Why would you choose a simple mirror when your mirror can be the center of the room? Relaxed, eclectic, minimalist, it is all about creating the right feeling. Imagine to be at home and have the feeling as if you would be looking at the perfect sunset. The sound of the wind on the beach. Decorate with good taste but don't be predictable, and conventional. Give an artful eye to the room. Use refined materials: the bubbles of water can be lamps, the scales of the fish can be the tiles of the kitchen backsplash. Relax and get inspired. Or take a look at these Florida properties, it inspired me to make this summer vibe post. A simple click, on the Like button of my FB page, and you are sure not to miss any of my blog posts.